It is our desire at Logos that our church family and friends must grow in the Word of God. We all know that God's Word is living and active, and that it is God's chosen means to teach us, to mature us and to grow us in our understanding of Him and the lives we live. For this reason it is our joy to provide you on our Website with a variety of Daily Devotions that are aimed at equipping you day by day. On Sunday mornings you revceive the Word from the pulpit, and then there is that weekly insert with challenges by others, and sure we have gatherings in the week to enrich you further, but let's be honest, when we compare the amount of time and input into our lives by the world against input from God, the world sadly beats God by far. So, instead of updating a few devotions daily, we are now providing you with links to a variety of devotions. Find out which ones suits you, and read it daily. Simply click on the graphics on the left, and it will take you straight to the devotions. CH Spurgeon is possibly the most qouted preacher in the world, and he has not been around since January 1892. But he still speaks through his daily devotions and published sermons. 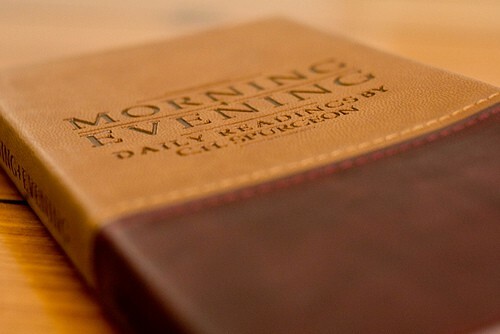 We highly recommend this devotion as it provides you with a challenge for both the morning and evening. Sure, the English is old English, but the truths will never date. Spurgeon simply has a depth and a way to say things that very few can. So click on the image on the left and enjoy these treasures from the past. Yes, dead men still speak thanks to the written word. DA Carson is one of the brains in modern day theology, that honestly yet conservatively approaches the Scriptures in one of the most responsible ways around. His daily devotions are highly recommended, and it includes a Read Through the Bible in a year programme. His devotions are not emotionally and 'feel good' driven, he simply presents the Word of God in context, with the raw facts and allows the Holy Spirit to apply true Scripture to your hearts. So, in short, he is not trying to play Holy Spirit, but he allows the Sword of the Spirit to do the work. You can read through these devotions year after year and it will always ring true. The rest of the material on The Gospel Coalition to which you are linked, you will also find greatly inspiring. Some devotions like that of Spurgeon and Carson are aimed at the head while that of Henry T Blackaby is aimed more at the heart. What he succeeds in doing is to apply Scipture in such a way that it will challenge you in your daily living. His desire is that you will experience God on a daily basis. I guess that is our desire here at Logos as well. We want to see you desiring God daily and applying the truths of God's Word in your life 24/7. I must be honest and say that I do not always agree 100% with the application, but with that said, I endorse this devotional at least 98% and I could not have done better. So I recommend this highly, but do read it with an engaging mind. You can only benefit. The rest of the material on their website are also worth your consideration. For our ladies: Just Between Us is a website that offers you daily devotions mostly by Jill Briscoe who is well known in international Christian circles. In this section you will find devotionals on attitude, contentment, encouragement, faith and trust, grace, hope, peace, patience, prayer, praise and worship, relationships, serving others, and spiritual growth and renewal. All important topics as we seek and find God in our daily lives. There are also various topics discussed, as well as hot topics. Again, we need to emphasise that we do not necessarily agree with every thought expressed, but overall the material is of great benefit and will encourage you in your growth. The only time it is purely God's Word is when Scripture is qouted, the rest of the time man's thoughts impact the material before us, but that is not necessarily a bad thing, as we are all on a journey and we stand on each other's shoulders. Enjoy! John Piper needs no introduction to us here at Logos. These daily devotions come highly recommended. You are also able to download the App onto your cellphone, from where you can access it daily. Perosnally I am reading through these at the moment. So click on the link at the left and be inspired. For the past four years we have provided you with some short daily devvotions by John MacArthur. Well it is time to introduce you to something else, namely his Daily Readings with a short devotional challenge. This will also link you to their website where you can dig into the riches of the sermons and other material presented by Dr Mac Arthur. These devotions are truly designed to see you grow in the grace of our God. Our desire is that the between all of the devotions that we can recommend, that you have found one that is truly uplifting and of eternal benefit for your soul. There are many devotions on the Internet that we cannot recommend, as they are like Rattax 90% sweety and 10% poison, but it is that poison that kills. They are dangerous as they have no regard for the meaning of the text in context, and teaching in error is distributed through the devotions into the Christian world. Don't trust anything just because it has a Christian label. The enemy comes as an angel of the light.